This paper reports the results of a series of economic experiments in which an environmental agency with a stochastic demand function enters an existing water market to buy or sell water for instream use. Previous experimental studies have examined the use of tenders to reduce water extractions and social suasion to maintain aggregate flow levels and compared imposing minimum flow restrictions with subsidizing downstream water use and the allocation of tradeable minimum flow rights. The important contribution of this paper is that it explores the consequence of having an environmental agency enter an existing water market. 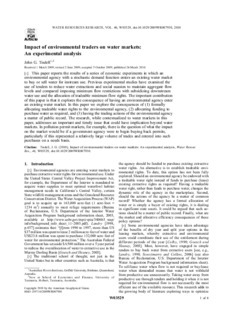 In this paper we explore the consequences of (1) formally allocating tradeable water rights to the environmental agency, (2) allocating funding to purchase water as required, and (3) having the trading actions of the environmental agency a matter of public record. The research, while contextualized to water markets in this paper, addresses an important and timely issue that could have implication beyond water markets. In pollution permit markets, for example, there is the question of what the impact on the market would be if a government agency were to begin buying back permits, particularly if this represented a relatively large volume of trades and entered into such purchases on a needs basis. Copyright 2010 by the American Geophysical Union.